Qerrbalak, sometimes spelled Qerr'balak, is the homeworld of both the Skrell and the Teshari. It is a small terrestrial planet with a humid atmosphere and a surface consisting mostly of swamps and jungles, with tundra at the poles. Most of the habitable surface and much of the shallower ocean terrain of the world is dotted either with Skrellian city-states that jut into the sky, or else smaller and more scattered Teshari settlements. Qerr'balak’s landmass can be separated in three distinct continents. The large terrestrial continents of Qorr'gloa and Xi'krii'oal, separated by the Qo’rria Sea, make up most of the habitable land together with the large archipelago of Mi'xo on Qerr’xia, the primary ocean of the planet. Qorr’gloa is a small, swampy continent on which modern Skrellian civilization first rose. Qorr'gloa is similar to Earth, with large city-states on the coasts and the shoreline and nature preserves and artisian farms further inwards. 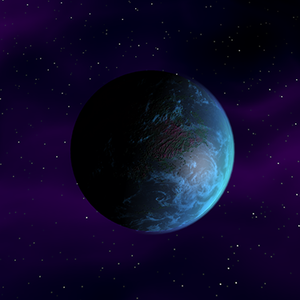 The largest continent, Xi’Krri’oal, was uninhabitted for most of the early history of the Skrell, but today contains most of the population of Qerrbalak. 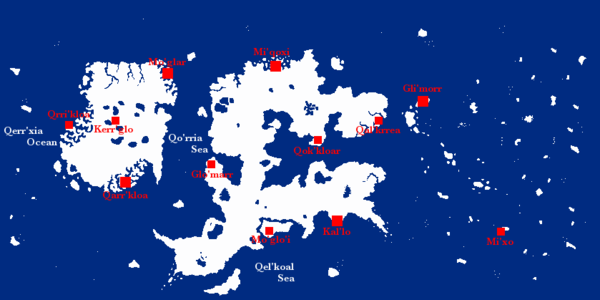 It is significantly more varied than Qorr'gloa, and is the continent on which the Teshari originated. The remaining Mi'xo archipelago is one of the most expensive places to live and work in the entire galaxy, containing some of the most powerful and dangerous Skrellian tech labs. Trade between city-states is done primarily for variety, as Qerrbalak's various city-states are self-sufficient, and is usually accomplished by orbital rocket or teleportation, a much more mature technology for Skrell than for humans. The vast road network that once conducted foot and motorized transit between the city states lies in a state of ruin, although the occasional sight-seer, Teshari clan, or criminal operation has been known to still brave them. Qerrbalak's Skrellian population floats at nearly 18 billion, with a standard caste distribution of around 5% Qerr-Katish, 15% Raskinta-Katish, 20% Talum-Katish, 25% Malum-Katish, and 35% Kanin-Katish. Ue-Katish are not a standard census category. Pre-existing Skrellian ethnic groups have come to mean little since the creation of the caste system and are also not counted. There are significant communities of Teshari, humans, and positronics living among the Qerrbalak'i Skrell, but very few Tajaran and Unathi. Most Skrellian city-states strive for self-sufficiency, and the homeworld exemplifies this. Each city-state is an arcology, a massive spire that stretches to the sky and contains its own food production, power generation, entertainment, and manufacturing. However, Qerr'balak's nonrenewable resources are mostly drained, forcing the "self-sufficient" city states to import significant quantities of plastics and metals from off-world, although true to their ethos the Qerrbalak'i recycling system is second to none. See Skrell. Qerrbalak is the epitome of the Skrellian caste system and Qerr-Katish monarchy. Mythically considered the first State-City ever built by the Skrell, Qarr’kloa attracts thousands of tourists and archeologists every year thanks to the well-preserved ruins scattered around the hyper-modern arcology. While ancient Skrellian history is now well-understood, Qarr'kloa's ruins remain imperfectly examined, and every young archeologist dreams of discovering a new breakthrough. Built on the northern coast of Qorr’gloa, Mo’glar was, early in Xi’Krri’oal’s colonization, a major port of trade between the two continents of the planet. It has kept that role to this day, boasting a hyper-modern spaceport and teleportation nexus and serving as a major lifeline to Skrellian exo-mining operations. This city, built on the small patch of islands north of Xi’Krri’oal, owes most of its current status to the infamous Qerr-Skria Glo’morr Krrixi who, early in history, built a large empire spanning from the Qo’rria Sea to the current city of Qal’krrea, mostly through military conquests. As the center of his empire, Mi’qoxi became a large center of population and industry. While the fall of the empire at Krrixi’s death did put a halt to the city’s growth, it is today still one of the biggest cities of the continent. A relatively recent city compared to the other major cities of the planet, Kal’lo owes its prominence to its status as the birthplace of the modern Skrellian constitution and the caste system. Kar'lo's prestige has a darker undercurrent: many city-states were forced to adopt the constitution by force, and even in the ensuing peace Kar'lo has maintained a reletively higher population of Raskinta-Katish. Gli'morr, small compared to continental cities, is nonetheless the largest city on the Mi'xo archipelago. Spilling out from a tiny island to a large underwater settlement, it is acclaimed for its research in theoretical physics and sociology. It boasts the most famous Academy in Skrellian space, and is constantly beset upon by immigration requests from those who want to attend.